In my previous post on this blog i wrote about how to start a blog where i outlined the basics of blogging as a beginner, you may like to check it out HERE if you are not quite aware of the very basic things you need to know before you can start making money through your blog just from the comfort of your home. Now i normally hear people say that blogging is a passion, that is quite true cause if you do not have passion for it don't even bother starting one but that being said there comes a time that you will tend to expect some reward for your passion and hardwork, cause trust me blogging without any reward attached will always lead to frustration. believe me when i say that a lot of people have giving up on blogging because of this very reason and if you do not want same scenario read on to know how to make money blogging. Now after putting those in place the next thing is to make sure that you always publish quality contents and not just publish whatever you feel like publishing, let your audience be glued to your blog each time they visit and after making sure of that i will now outline some of the various platforms through which you can earn some money blogging from the comfort of you home. 2. Make Money via Sponsored Posts: Sponsored posts can come individually or via a firm, i previously wrote a blog on how to monetize your blog with valuedvoice now they are one firm i have tested and certified them might want to check them out via www.valuedvoice.com and one lovely thing about sponsored posts is that all is on your own terms, you have the opportunity to fix whatever price you so which per blog post published on your blog. 3. Make Money via Affiliate Marketing: When we talk about affiliate marketing if you don't know already, it's basically telling your audience of the availability of certain product or services and when they in turn purchase via your link you get a commission. Top of the list for me are Amazon, Ebay, Shareasale and Alibaba. but there are many more which you can always google. 4. 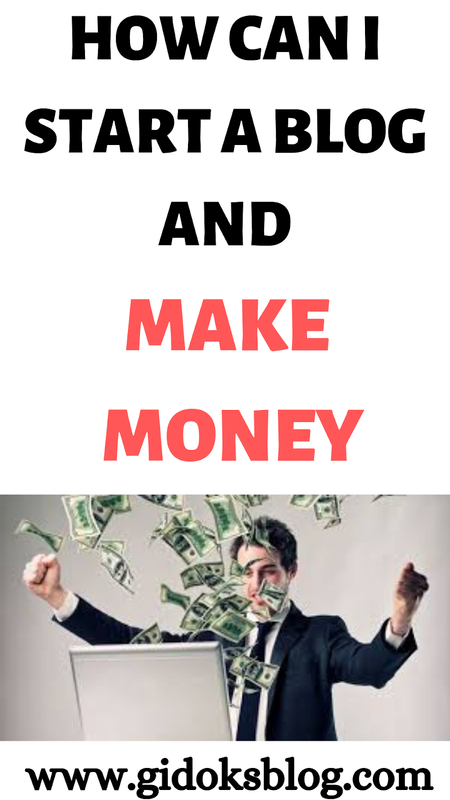 Make Money via E Books: This is basically putting some lecture on a subject matter you have knowledge on in a digital form and selling it out and making your profits. Those are the ways through which you can start a blog and make money, Actually there are lot more but those are top on the list that many people have tested and confirmed. All of these are wonderful ideas for monetizing our blogs. ImI still having trouble with getting sponsored post opportunities, but, I'm sure they'll come around eventually. great ideas to monetize your blog! and your post is nicely written, I enjoy reading it! Great tips! Your blog is awesome and you provide so many great resources. Thanks for always sharing your knowledge! Currently, I'm using Google Adsense and also,. sponsored posts. I'm also learning on betetr affiliate marketing and I hope to see the fruits of that soon. This is a helpful post. I am trying to do better with monetizing my blog as well. Thanks for the information!